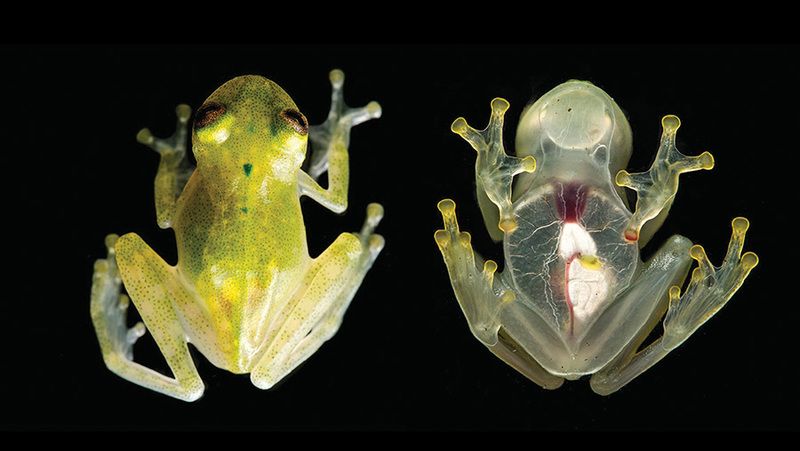 In the Neotropics, there is a whole group of so-called glassfrogs that amaze with their transparent skin covering their bellies and showing their organs underneath. A recently discovered new species from Amazonian Ecuador, however, goes a step further to fully expose its heart thanks to the transparent skin stretching all over its chest as well as tummy. The new amphibian is described by a team of scientists led by Dr. Juan M. Guayasamin, Universidad San Francisco de Quito, Ecuador, in the open access journal ZooKeys. It can also be distinguished by the relatively large dark green spots at the back of its head and the foremost part of the body. Additionally, the species has a characteristic long call. The new frog is named Hyalinobatrachium yaku, where the species name (yaku) translates to ‘water’ in the local language Kichwa. Water and, more specifically, slow-flowing streams are crucial for the reproduction of all known glassfrogs. The reproductive behaviour is also quite unusual in this species. Males are often reported to call from the underside of leaves and look after the egg clutches. Having identified individuals of the new species at three localities, the researchers note some behavioural differences between the populations. Two of them, spotted in the riverine vegetation of an intact forest in Kallana, have been calling from the underside of leaves a few metres above slow-flowing, relatively narrow and shallow streams. Another frog of the species has been observed in an area covered by secondary forests in the Ecuadorian village of Ahuano. Similarly, the amphibian was found on the underside of a leaf one metre above a slow-flowing, narrow and shallow stream. However, at the third locality – a disturbed secondary forest in San José de Payamino – the studied frogs have been perching on leaves of small shrubs, ferns, and grasses some 30 to 150 cm above the ground. Surprisingly, each of them has been at a distance greater than 30 metres from the nearest stream. The researchers note that, given the geographic distance of approximately 110 km between the localities where the new species has been found, it is likely that the new species has a broader distribution, including areas in neighbouring Peru. The uncertainty about its distributional range comes from a number of reasons. Firstly, the species’ tiny size of about 2 cm makes it tough to spot from underneath the leaves. Then, even if specimens of the species have been previously collected, they would be almost impossible to identify from museum collection, as many of the characteristic traits, such as the dark green marks, are getting lost after preservation. This is why the conservation status of the species has been listed as Data Deficient, according to the IUCN Red List criteria. Nevertheless, the scientists identify the major threats to the species, including oil extraction in the region and the related water pollution, road development, habitat degradation and isolation. 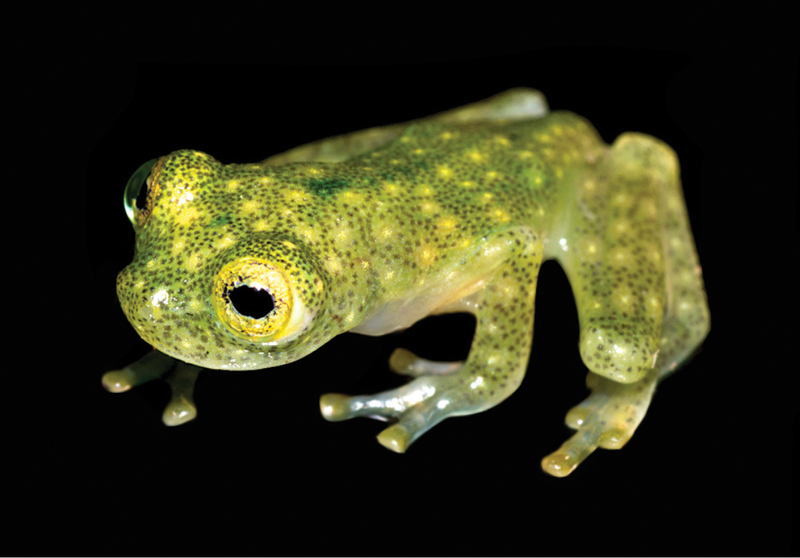 “Glassfrogs presumably require continuous tracts of forest to interact with nearby populations, and roads potentially act as barriers to dispersal for transient individuals,” explain the authors.